After realizing the prototype of their engine, Barsanti and Mattuecci continued their research and contemporarily felt the necessity to patent it before others could copy the principle and take the credit for it. Therefore they initiated the documentation needed to obtain a patent in England, the European leader of commerce and industry. They applied to Haehner, console of Saxonia in Livorno, that had commercial relations with England, so the documentation could be initiated for the patent. After a short time, Haehner informed our scientists that the Patent Office had suspended their documentation because some similar patents had been given to others (Brown, Wright, Barnett and Johnton et al); furthermore the valiant technician of the Patent Office, Engineer May, had expressed a clearly negative decision about the invention. 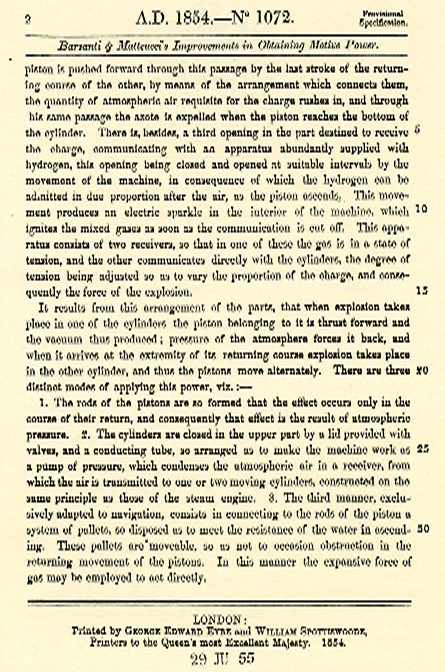 Barsanti opposed this decision energetically, which he believe to be absurd, and asked Haehner to point out to the Patent Office that his engine used a non original principle, as it used an explosion to obtain work, but the mechanical system which transformed the explosion in mechanical work was original. After this Barsanti and Matteucci obtained their long-desired certificate, which was given to them on the 12th of June, 1854; the certification, which carries the No. 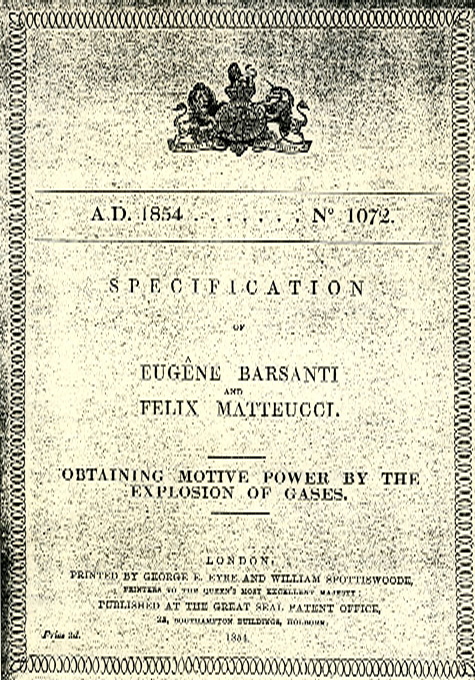 1072, was published in the Morning Journal of London with the title Specifications of Eugene Barsanti and Felix Matteucci Obtaining Motive Power by the Explosion of Gases. In a letter dating June 26, 1854 Haehner tells Matteucci that the documentation had been attained. 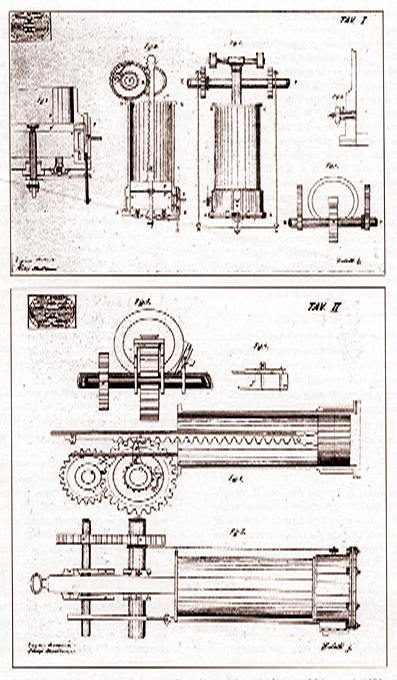 Encouraged by the attainment of the certificate and by the results of their experiments of the engine constructed by the Benini Workshop, Barsanti and Matteucci founded the “Association for the Construcion of a new Engine” on October 21, 1854 in order to better utilize the future patents and the fruits of the application of their invention. The Association was open to whomever was interested in concurring in this venture with the holding profits proportional to the economic commitment. It is the preview of the future Society which would be founded five years later. In 1854 o maybe the year afterwards, Barsanti and Matteucci seemed to have an engine constructed following the project in the English certificate. It is a bi-cylindric alternating engine with twin cylinders operating on the same driving shaft. A bi-cylindrical engine true to the 1854 English certificate and able to produce eight horsepower was surely constructed in 1856 by the Benini Foundry. 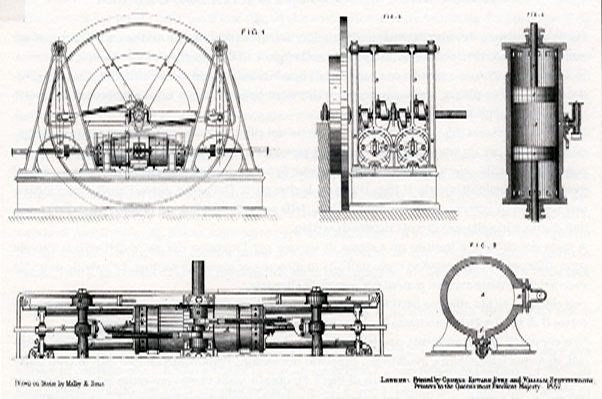 The engine, which was used to run some machines in the workshop of Maria Antonia train station in Florence, was also reported in the Acts of the R. Lombard Institute of Science, Letters and Art, vol. III, issue XVII, Milan 1863. After having obtained the certificate in England, Barsanti and Matteucci lost the right to it after not paying an installment due to ignorance of the English laws about patents or for some other motive we do not know. In the meantime, the engine underwent new and continuous improvements which put the inventors in the condition to ask for a new patent from the same Office. This operation, from what experts in this sector say, was done in secrecy and therefore without any publicity. The Patent Office clerk, Mr. Newton expressed himself in these terms. 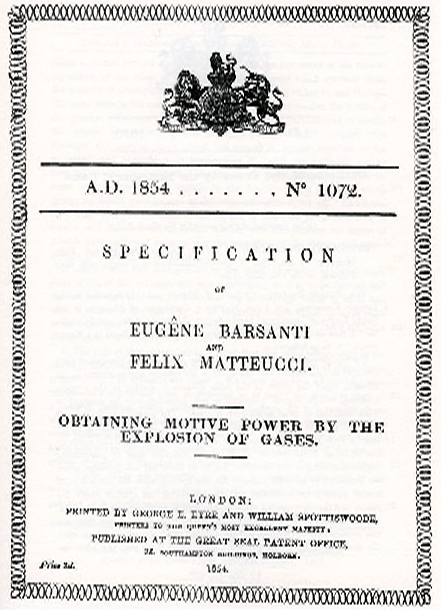 On the 12th of June 1857, Barsanti and Matteucci finally attained a second English Patent, No. 1655. The temporary certificate of the patent was mailed to Barsanti and Matteucci on the 29th of June of the same year. On December 12, 1857 the Great Seal Patent Office conceded patent No. 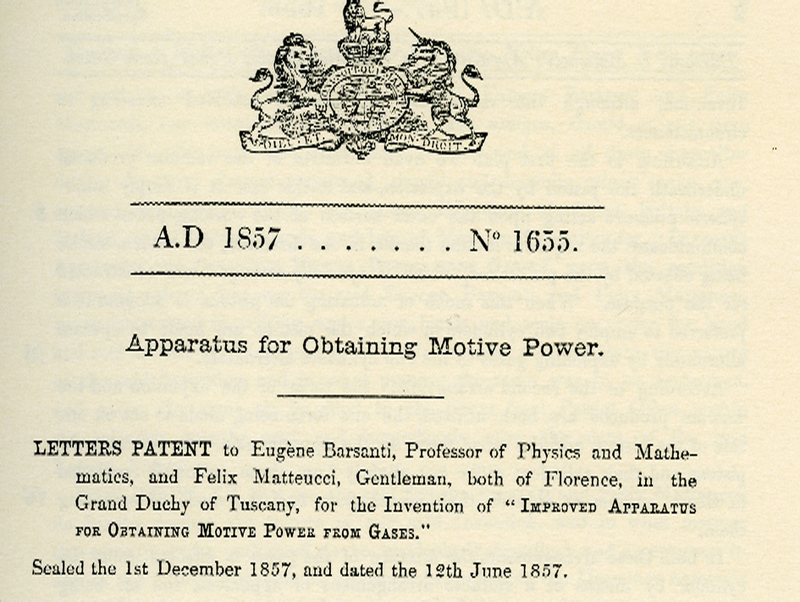 1655 to Barsanti and Matteucci for the invention of an Improved Apparatus for Obtaining Motive Power from Gases. The constructive solutions for this patent were twofold: the first was the auxiliary piston engine or, how it was indicated in the engine’s patent, a counter piston, and the second was the engine without a counter piston. The engine, which was an alternate action type, used a rack and pinion equipped with a pawl in order to transform the longitudinal motion into rotational. The cylinder was placed vertically upside down; it was open on top so it permitted in air of the piston movement. The lower part of the cylinder was closed by an iron cover fixed in place by bolts (much like the cylinder heads of modern engines). In the cover there were two conic valves (such as modern engines) with springs that open outwards. In the bottom part of the cylinder (combustion chamber), where the explosion of the gaseous mix occurs, there could be a second piston (counter piston), driven by a cam moved by the motor shaft; its function was to aspirate the gaseous mix and expel the products of the preceding combustion from the cylinder. Next to the combustion chamber, a device similar to the slide valve of steam engines, which regulated the introduction of air and hydrogen into the combustion chamber through two communicating openings. The slide valve was put into action by two rods commanded by two cams rotated by the motor shaft. Barsanti and Matteucci presented another project with the same patent. It was a more simple engine which could produce faster rotation. The engine did not have a counter piston and the only piston moving through the entire length of the chamber did the work of a counter piston, that is to say, aspirating the gaseous mix and expelling it at the end of the cycle. ; the various phases were organized by a slide valve which would close the air and gas entrances. Substantially, it was the same engine which had been experimented in the Maria Antonia railroad station workshop at Florence, even though it differed because it had only one cylinder. The electric spark in the gaseous mix occurred when the openings of the chamber were closed and the piston was rising in the cylinder, and not linked to the driving shaft by the pinion pawl that engaged the piston rack. We would like to point out that the text of the following patent has never been made privy by experts that were interested in Barsanti and Matteucci’s opera (even though its existence was known). It precedes the French patent by little and therefore should be considered the first important patent of the Barsanti and Matteucci engine. In conclusion of this section, we would like to point out two things. IOn the 9th of January, 1858 Barsanti and Matteucci also obtained a patent from France. As we can see from the picture, they are the same as the English patents, excluding the letters, which are different in some parts of the picture. It is therefore a French patent of the same engine already patented in England. For this reason we will comment no further, saying all that is needed to be known in the previous chapter. The French patent had been preceded by a similar patent obtained in the Piedmont state on December 30, 1857 No. 579 in Volume VI of the Savoy Patent Office. Barsanti and Matteucci had gone to the Capuccio and Latini Agency which then prepared the just documentation for them. On the 2nd of January 1858, Barsanti and Matteucci presented the patent request for the first version of the counter piston engine at Turin: the patent-right bears the number 700 of Volume VII of the Patent Office of the Reign of Piedmont. In August of 1861, Barsanti, Matteuci and Babacci, a man from Forli which had started to collaborate with the duo since February 1857, presented the request for a patent right to the Patent Office of the Reign of Piedmont for a new type of engine using alternating counter pistons. The patent was granted on October 28, 1861 Volume III, No. 141 entitled : New improved method of using an explosion of a mixture of atmospheric air and a inflammable gas in order to produce a driving force. An examination of the patent shows that the text is similar to the English patent of December 31, 1861 No. 3279 entitled Improved apparatus for obtaining motive power from explosive compounds, registered on the 29th of April 1862. This patent also contains a reference to a machine that had been already built, that without a shadow of a doubt, was the engine constructed by Escher and Wyss in Zurich. 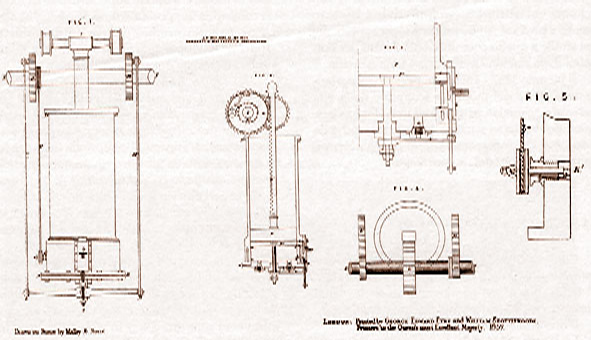 In March of 1862, Matteucci went to Paris for the New Engine Society with the goal of renewing the patents that had expired and to claim the priority of their invention in regards to the direct action engine of Lenoir. 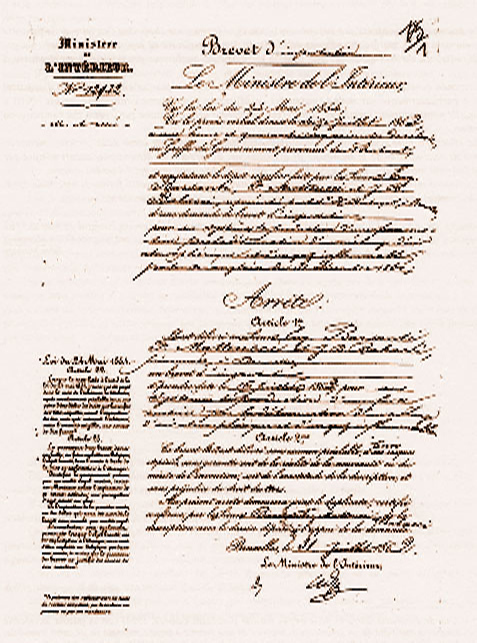 On March 31 he deposited a second French patent no. 52509 which was assigned to Felice Matteucci only and entitled Improved system of air and gas engine, registered on May 24 1862. On July 16 1862 the English patent was also registered in Belgium with the no. 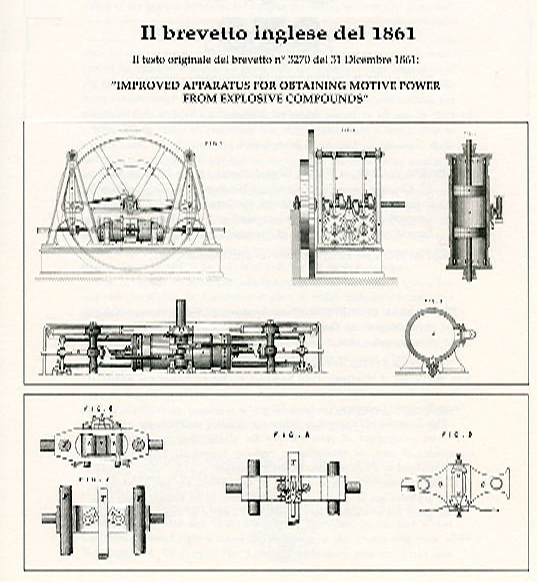 12922 released to Barsanti, Matteucci and Babbacci with the writing “Imported Patent”, entitled New improved systems for obtaining motor force by means of an explosion of a mixture of air and an inflammable gas and registered on July 31, 1862. 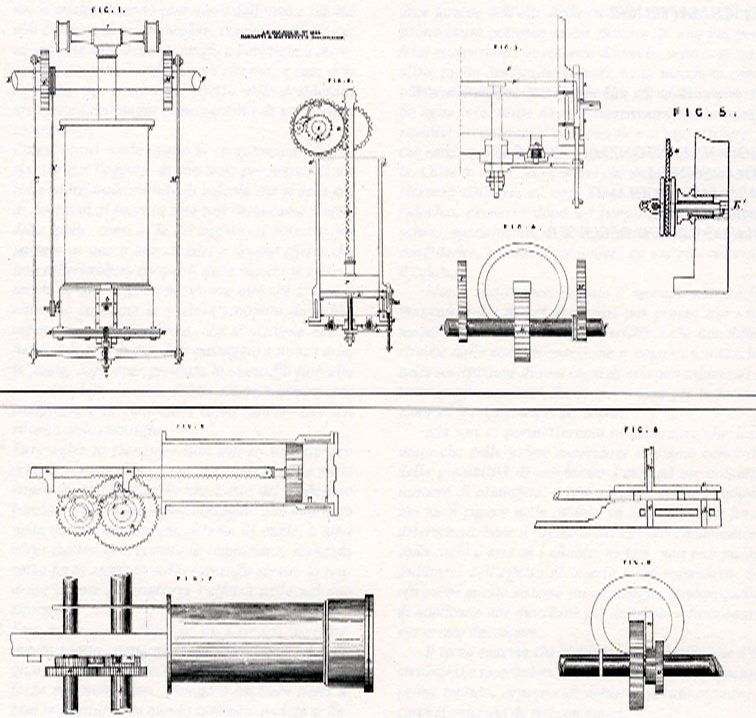 After Barsanti’s death and Matteucci’s exclusion from the New Engine Society, Felice continued to work and imagine new solutions which he patented in Italy on June 25 1866, patent-right no, 3096, 1 released to Felice Matteucci and colleagues of Florence entitled Igneous – pneumatic engine, and registered in the Industrial Bulletin of the Reign of Italy Volume VI no. 485. Even Babbacci, who had abandoned the New Engine Society in 1862, continued to work on the internal combustion engine, so much so that on April 15 1868, he presented in Italy the patent-right no. 3849 entitled New systems for gas engines, Babacci system, registered in the Industrial Bulletin of the Reign of Italy on May 7 1868 Volume VIII no. 195. The patents documented until now are recapitulated in the following list. October 28, 1861 Piedmont Patent no. 1397 New improved method of using the explosion of a mixture of air and an inflammabile gas or in general an explosive liquid to obtain a useful force. December 31, 1861 English Patent no. 3270 Improved device for obtaining motor force from explosive mixtures. July 16, 1862 Belgian Patent no. 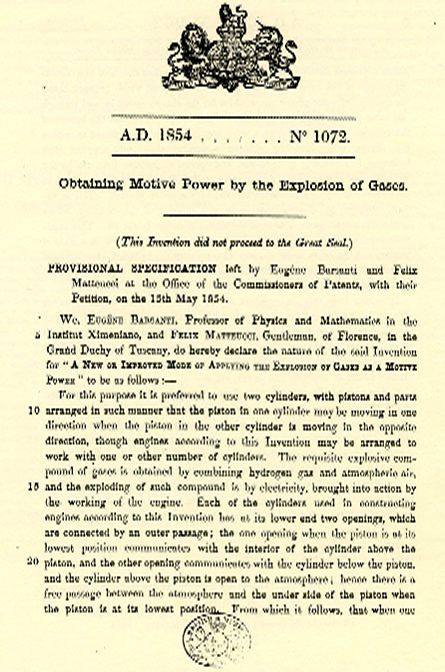 12922 New improved systems for obtaining mortor force by means of an explosion of a mixture of air and an inflammable gas invented by Eugenio Barsanti, Felice Matteucci and Giovan Battista Barbacci. June 25, 1866 Italian Patent no. 3096 Igneous-pneumatic engine invented by Felice Matteucci and collegues in Florence. May 7, 1868 Italian Patent no. 3849 New systems for gas engine, Barbacci system. The documentation for the English Patents were always prepared by the Newton Agency of London. 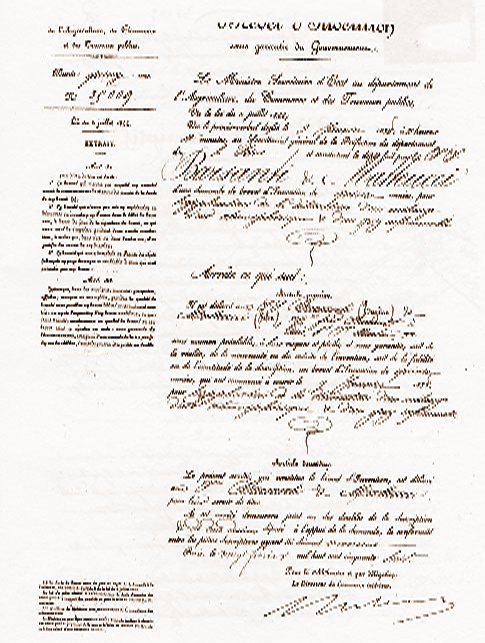 The Belgian Patents were prepared by the Bosquet Agency.